Fresh from the garden produce is tasty and good for us, but sand and grit add an unappetizing crunch we can do without. 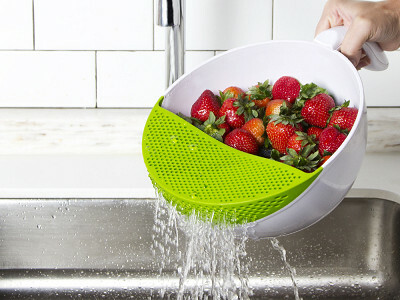 The Soak and Strain Produce Washing Bowl will shower your salad fixings with love and get rid of the unwanted “seasonings.” The sturdy 3.5qt washing bowl has an easy grip handle and a hopper/strainer built in that will rinse the grime from fruits and vegetables and send it right down the drain leaving you with gleaming produce. The bowl is dishwasher-safe, hygienic and has a no-slip bottom. Give everything a good “soak” then garnish with abandon. Soak and Strain is a well-kept kitchen secret you’ll be happy to share. 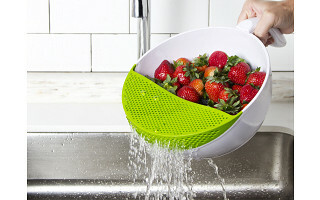 The sturdy 3.5qt washing bowl has an easy grip handle and a hopper/strainer built in that will rinse the grime from fruits and vegetables and send it right down the drain leaving you with gleaming produce. The bowl is dishwasher-safe, hygienic and has a no-slip bottom.